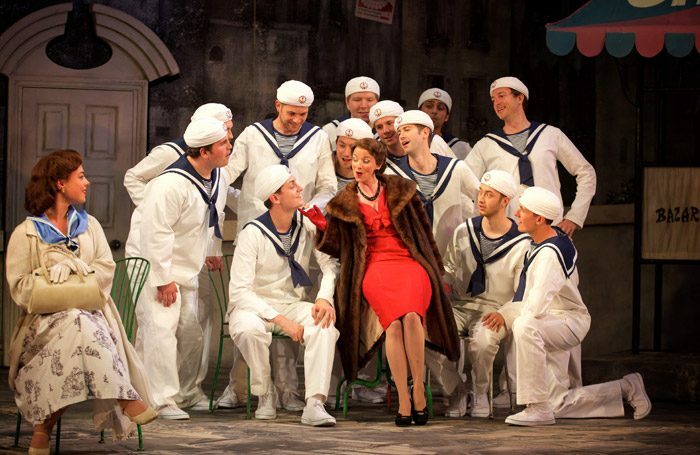 Martin Duncan’s 2011 production of Rossini’s frothy and at times acerbic comedy makes its first return at Garsington. It’s an evening that delivers on many levels. The resetting to 1950s Italy allows for a focus on glamour, nostalgia – hence the huge tourist billboard celebrating Naples – and vivid colouring, all of which designer Francis O’Connor exploits to full effect. David Parry, a justly celebrated Rossinian, conducts a performance that is equally colourful and crisply pressed, adding further drama with his continuo playing at the fortepiano. The poet Prosdocimo, a puppeteer in the manner of Mozart’s Don Alfonso from Cosi fan tutte, surveys the results of his social interferences with unalloyed excitement, whether meddling on the ground or observing from his raised study on high. And what a view it is. Sarah Tynan sounds utterly ravishing as Fiorilla. Quirijn de Lang returns as Selim, the Turkish prince, effulgent in tone and chiselled of jaw. They both look gorgeous and their scenes together ingeniously balance comedy, parody and physical desire. As impressive is Geoffrey Dolton’s performance as Fiorilla’s long-suffering husband Genario, a deftly drawn characterisation of the nervous, emasculated ‘straw man’. Not for a second does Dolton come out of role. There’s bright, Italianate singing too from Luciano Botelho’s Narciso and from Jack Swanson in the smaller role of Albazar. As the effects of Prosdocimo’s social engineering ripple out across the stage, there’s another alchemy here – the fusing together of first-rate singing, vivid orchestral playing, pin-sharp comic acting, glamorous design and witty directorial touches too numerous to mention. It’s as close to perfection in a Rossini comedy as you could wish for. A world-class achievement.